With a growing demand for ever-smaller, more sophisticated digital cameras, camera manufacturers have to push the boundaries to vie for consumers' hard-earned cash. When it comes to developing high-end compacts, Canon usually succeeds in coming up trumps. That said, with a threat on the horizon in the shape of the latest highly specified compact system cameras (CSCs), camera manufacturers have to make their advanced compacts work harder than ever to win customers. 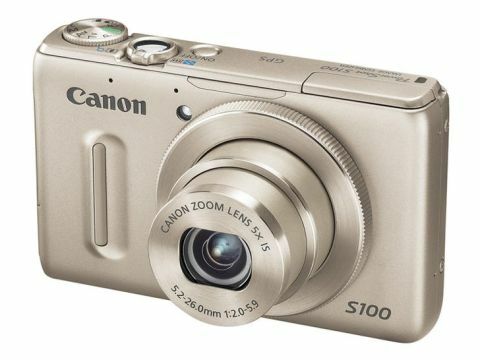 To that end, Canon has gone all-out when developing the replacement for the older PowerShot S95. The new PowerShot S100 – incorporating a 12.1Mp, 1/1.7-inch CMOS sensor, 24-120mm (35mm equivalent) zoom lens, the latest DIGIC 5 processor and GPS functionality – is a fully-featured compact that's aimed at advanced enthusiasts. Compared to its predecessor, the S100 has undergone some radical changes, sporting a completely revamped feature set. The camera's sensor is the same size as the one in the S95, but the CCD has been swapped for a CMOS, and the resolution has been ramped up to 12.1Mp (maximum image size is 4,000x3,000 pixels), compared to the S95's 10Mp (3,648x2,756). The processor has been upgraded from DIGIC 4 to the latest DIGIC 5 version, promising increased speed and better image quality. The ISO sensitivity range on offer from the new model has also been extended to cover ISO80-6400, whereas the S95 topped out at ISO3200. The S100 retains the ability to shoot raw files, and it offers a speedier default burst mode – 2.3fps compared to 0.9fps – as well as a new High-speed Burst HQ mode that can capture up to eight full-resolution shots at a rate of 9.6fps. Further new additions include a closer-focusing 3cm macro mode (improved from 5cm on the S95), plus the new ability to shoot Full HD 1,920x1,080 video at 24fps with stereo sound: an improvement over the old model's 720p recording. So there's plenty of new functionality to explore, but has Canon succeeded in taking the lead in the competitive advanced compact sector of the market? Read on to discover how much of a difference these changes make to the S100's real-world performance.